These ‘Top Gear’ photos date from 1977 (with the Lotus Esprit and Porsche 928 photos) and 1982 (with the photo of the Ford Granada). They show early in-car recordings onto 1″ videotape. The recording machine was the VPR5. The camera mounted on the Lotus and Porsche is the Bosch Fernseh, which was one of the first ‘lightweight’ cameras, although it was extremely heavy in reality. 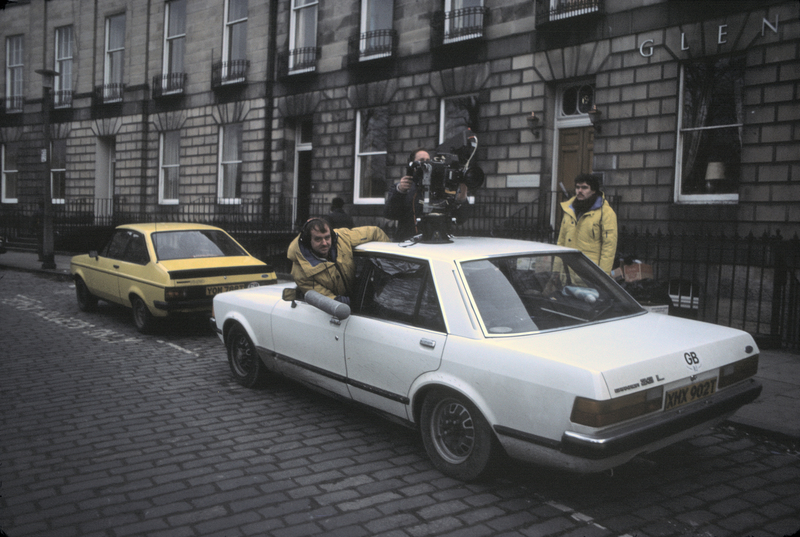 The camera mounted on the roof of the Ford Granada is an Ikegami, probably an HL79. It is being operated by Keith Salmon, director David Weir is holding the gun mic and Tony Wass is on the right-hand side. Inside the white Granada, Steve Searly is operating the racks control for the VPR5. John Burkill, VT editor/engineer would have set up the VPR5. The photos show how cumbersome in-car recording was in the 1970s and 80s in comparison to today, when cameras can be really tiny. Blimey that’s bought back memories!